What do you get when you combine the talents of a director now known for his fondness of Russian Literature, a composer best known for his minimalist and ethereal scoring, a cast of unknowns and source material from professional horror weirdo Clive Barker? The answer is one of the great Horror films of the 1990s. Between Freddy and Jason’s last hurrah and Wes Craven’s ironic revitalisation of the genre Horror cinema was in an odd place. The Franchises which had made the genre such a juggernaut in the 1980s had all reached their nadir and nothing was coming to fill their place. There would be some truly great films made in this Horror hinterland, but none of them would really impact the market in the way that the Friday The 13th and Nightmare On Elm Streets film had. Candyman is one such film; produced in 1992 the movie would garner good reviews and would have moderate success at the box office earning close to twenty five million at the box office. It is easy to see why Candyman would become such a popular character, even when divorced from the context of his own film. Barker has always been a master of regal, intelligent and hideously beautiful villains. Pinhead, Candyman and even Nightbreed’s Dr. Decker are all villains who mix a conceptually simple and striking design with an intelligence and maleficent theatricality. Candyman is an archetypal Barker villain spouting well rehearsed prose and combining a sense of the horrific and the sensual. However despite the first film tripling its production budget the series would only be revisited twice. In a horror market currently dominated by remakes and reimaginings it is hard to understand why a character with such innate market appeal would be given such short shrift. Candyman’s box office success but lack of exploitation may come from the very nature of the film itself which uses the iconography of a traditional slasher film to mask something a little more complex. The film is based off of Clive Barker’s short story The Forbidden and is focused on an ambitious graduate student named Helen Lyle (Virgina Madsen) who is conducting research for her thesis on Urban Legends. As she interviews Freshmen at her college she comes across the legend of the Candyman, a supernatural hook handed killer dispensing bloody retribution to whoever speaks his name five times whilst looking at a mirror. As Helen investigates the legend further she finds out about Candyman’s roots in the Cabrini Green housing project and about a rash of murders attributed to the mythological figure. It is this last point that is of the most importance to the movie, the notion of an entire community generating folklore to explain away the escalating gang violence they see around them. Dozens of people have been killed with a hook in the housing project, leading to an almost cult of the Candyman being created. When Helen and her friend Bernadette Walsh (Kasi Lemmons) investigate Cabrini Green, and specifically an abandoned apartment where the last Candyman killing took place, they find the housing project daubed with the iconography of the hook handed killer. The residents of Cabrini Green have become so terrified of this mythological character that a gangster has taken up the mantle of the killer dispensing his own form of brutal justice in Candyman’s name. This is the point where the film starts to play with audience expectations. As viewers we go into films with certain expectations, we subconsciously arm ourselves with information whether garnered from reviews, publicity information or word of mouth. With a movie like Candyman we approach the film already knowing about the hook handed killer, already having seen images of Candyman in promotional material and as such we make the intellectual choice to accept that within the reality of the film there exists a supernatural killer who is murdering people for the mundane crime of reciting his name. This complicity makes us approach the film in the same way that the residents of Cabrini Green approach their daily lives. Every crime and act of villainy in the film is attributable to this killer and as we see Helen look through newspaper killings detailing the serial murders in the housing project we assume that they are all the work of the supernatural Candyman, a character who can appear at will, can murder without question and who at the start of the film even offers his own introduction. They will say that I have shed innocent blood. What’s blood for, if not for shedding? I’ll split you from your groin to your gullet. As such when we are offered the person responsible for the serial killings halfway through the film we are forced to evaluate our own notions of how the world works. The titular killer has been revealed to be a person of flesh and blood, a gruff gang enforcer who maintains order in Cabrini Green through sheer terror. We are shown his motives and methods, Helen discovering that the different apartments in the housing project are connected by a crawl space behind medicine cabinets. The initial supernatural elements of the film are quashed and subsequently introduce a second supernatural element, something far more interesting than an otherworldly serial killer. Candyman’s initial appearance comes late in the movie, long after we have heard his legend and seen his imagined handiwork. With Helen having succeeded in getting the ‘real’ Candyman put into prison the residents of Cabrini Green have abandoned their faith in the hook handed killer, realising the murders were perpetuated by man and not avenging ghost. This lack of faith threatens the Candyman who is a being who exists and relies upon his legend. Without faith in his existence he will fade into nothingness and as such he meets his destroyed head on and makes her a part of his legend. The whisper in the classroom! Whereas the first half of the film deconstructs the notions of urban legends and mythology (the first scene in the film parodying the aesthetic of slasher films in general) the second half showcases the urban legends making their fight for survival. The Candyman draws Helen into his own mythology by carrying out gruesome murders and abductions and marking Helen as the prime suspect. The film takes a few interesting choices in this half, chief amongst them being the nagging sense that Helen herself is responsible for the crimes. There is an ambiguity to the murders generated largely by the deconstructive elements of the first half. 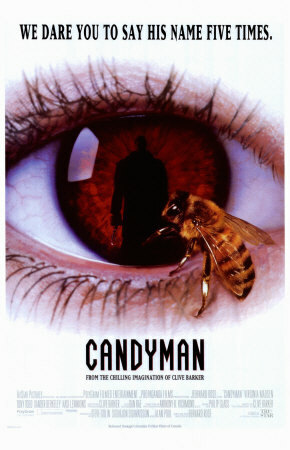 Whilst a traditional horror film would have the audience understand that Helen is being framed by the murderous ghost of a 19th Century artist with a hook for a hand and passion for bees, Candyman has already sown the seeds of doubt about such things and as such it is impossible to discount that Helen is going slightly insane. 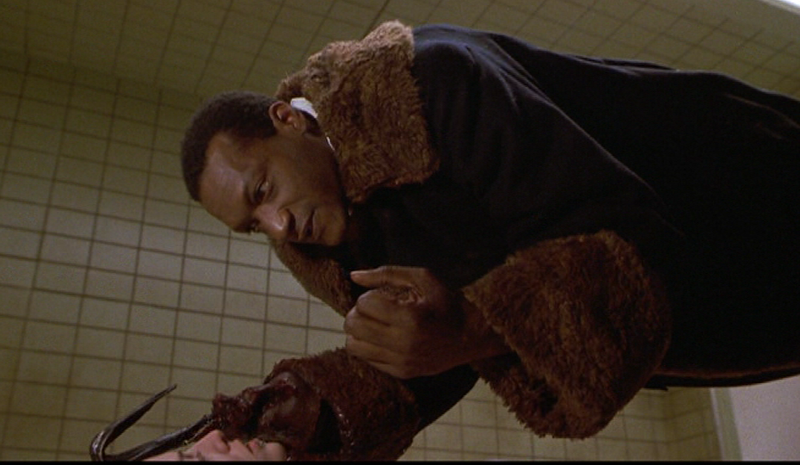 The ending of the film, in which Helen becomes a legend herself and enacts a brutal vengeance on her husband, suggests that the filmmakers expect us to believe that conceptually it is possible for the Candyman to exist as a wraith. 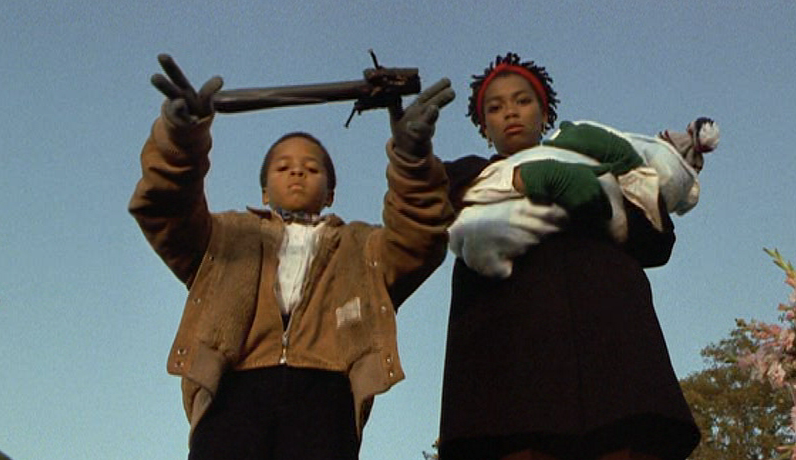 The residents of Cabrini Green have killed the Candyman, burning him alive in a pyre and as such he stops existing, but Helen now legendary for her obsession with the Candyman and the murders of several people takes his place as a mythological spectre. This probably buggered up any plans for continuing the series. This intellectual pondering on the nature of folklore and myth is just one example of a product which just operates on another level to most horror. From the opening aerial shots of Chicago scored to Philip Glass’s ghostly main theme the film just exudes a sense of high minded beauty. Bernard Rose who takes credit as both writer and director would showcase a prodigious talent for horror which would sadly never be showcased again. He would have previous experience with fantasy due to his earlier work on the fantastic Paperhouse but his resume wouldn’t suggest him capable of such a great piece of cinema as the gothically regal Candyman. What bolsters Rose’s vision is a cast of actors who are exceptionally comfortable in their respective roles. 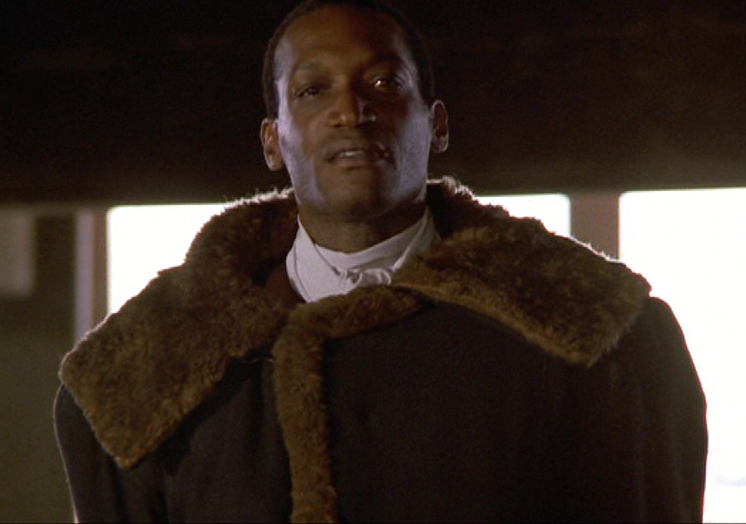 Tony Todd is simply fantastic as the lyrical and sinister Candyman; he has a physicality and presence which allows him to dominate the film despite his dearth of actual screentime. Virgina Madsen is probably the standout performance in the film, giving depth and humanity to a character who could be aloof and cold if not handled correctly. She takes the dual role of being the emotional and intellectual core of the film and carries it off effortlessly. That is the strange thing about Candyman, the only proven element of quality in the film is Philip Glass who provides the haunting if a little magisterial soundtrack. Bernard Rose despite Paperhouse was coming off of two truly terrible films, Virgina Madsen had hardly proven herself as an actress, Tony Todd was better known for TV work than film acting his only notable work being in the remake of Night of the Living Dead and a small role in Platoon, and Barker adaptations had generated one box office smash and one well intentioned disaster. Yet somehow these disparate performers were able to pool their talents and create something that was truly fantastic. A lyrical, beautiful, bloody, intelligent and horrifying film about a 19th Century ghost with a hook for a hand.